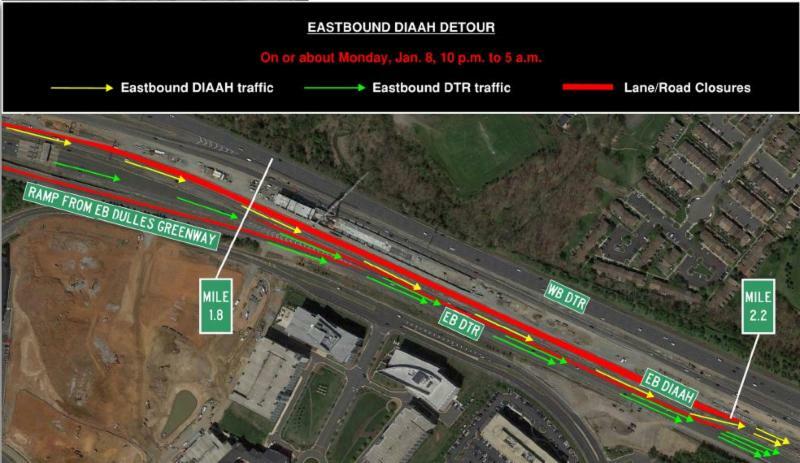 UPDATE: Nighttime Detour of Eastbound Dulles Access Highway Set Monday, Jan. 8 at 10 p.m. to Tuesday, Jan. 9 at 5 a.m.
Monday, Jan. 8 at 10 p.m. to Tuesday, Jan. 9 at 5 a.m.
On or about Monday, Jan. 8 at 10 p.m. to Tuesday, Jan. 9 at 5 a.m., the eastbound Dulles International Airport Access Highway (DIAAH) will be diverted to the eastbound Dulles Toll Road (DTR) near the site of the Silver Line's Innovation Center Station. Lane closures will also occur on the Dulles Toll Road (DTR) and the Dulles Greenway while Dulles Corridor Metrorail Project crews continue construction of pedestrian bridges at the Silver Line Phase 2 Innovation Center Metrorail Station east of Route 28. See details below. Eastbound DIAAH traffic will return to the DIAAH at mile marker 2.2, just prior to the Centreville Road bridge and all lanes will be restored for eastbound DTR users.